We awoke prior to sunrise, to the sound of Djembe drumming, about three hours after we had entered our nomadic tent for our short, but well needed sleep. What we found when we exited our tent was that we were in a vast pinkish-orange desert, at the bottom of a huge sand dune, surrounded by many other, shorter dunes. The palm trees in the oasis where our camp was assembled, were the only vegetation you could see for miles around us. 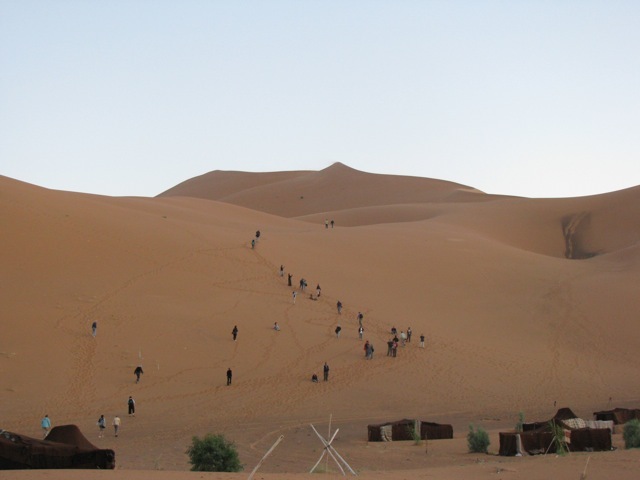 Most of our tour members scattered across the dunes, many of them climbing to the top of another large dune next to the dune behind our camp. Many people (such as myself) were taking pictures of everything around us, but some were just taking in the surroundings, obviously enjoying a personal, spiritual experience. A song emanated from the top of the dunes (this is a very musical group of people assembled for this tour). What I noticed was the beauty of the wind-blown sand, the patterns that are formed, both the small details that are only evident when you are very close, and the larger details, such as how the sand banks form sharp edges as the sand is pushed up by the wind. Words cannot adequately describe the beauty of the Sahara desert, and I’m not sure these accompanying pictures really do it justice either. 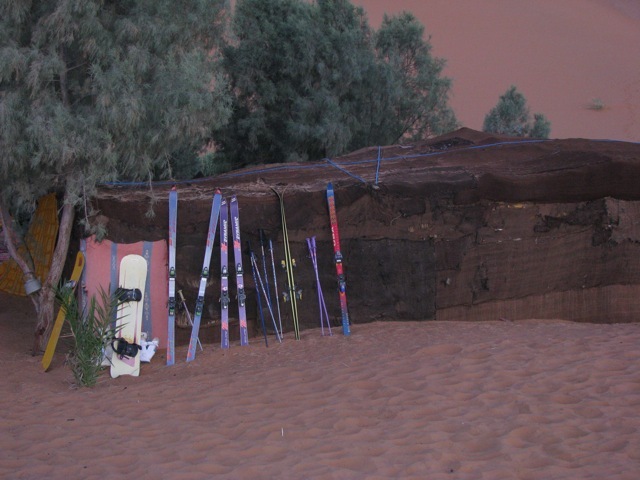 As I walked around the camp, I was surprised to find skis and snowboards leaning against the back of one of the tents. 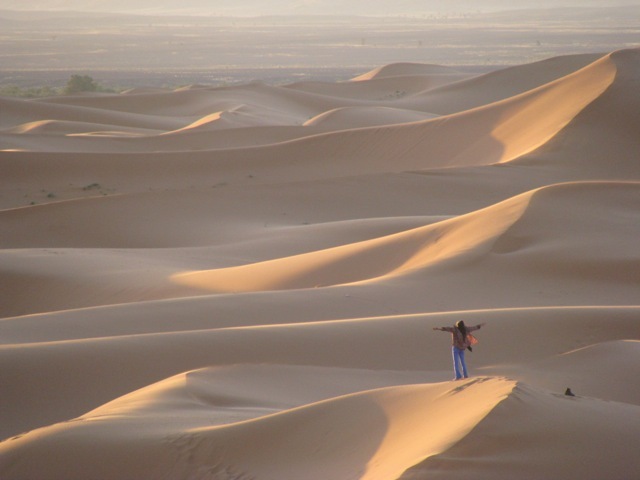 I guess it makes sense, since the Sahara sand is so fine-grained, that it does almost feel like warm powered snow to the touch (nothing like the rocky sand you find on California beaches, both in texture and color). Nobody was using the skiing equipment, but I would have loved to try it myself, or at least seen one of the Moroccan youth hosting our camping trip using them. 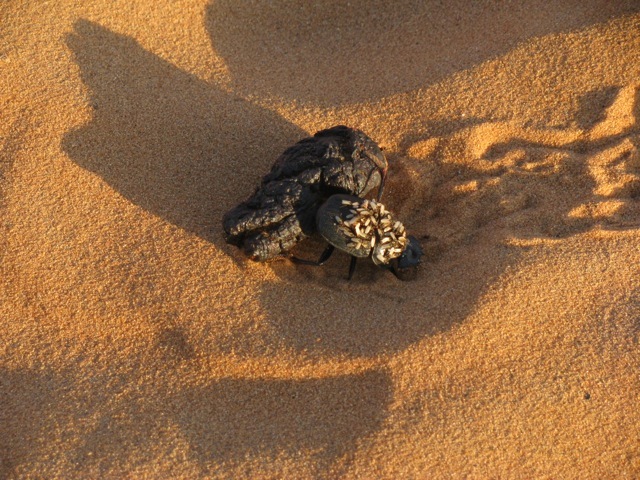 We came across a dung beetle, pushing an animal dropping across the desert (larger than the beetle itself). We didn’t stick around to see where it was taking it’s newly acquired prize, but it just goes to show that one creatures waste can be another creatures most cherished possession. 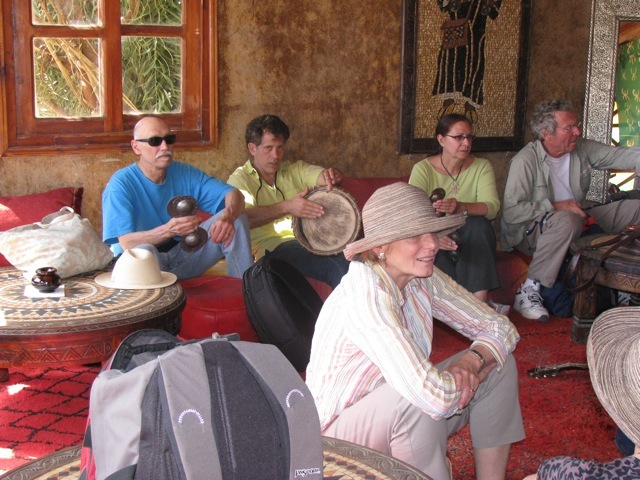 As we were packing our belongings, Dror sat and played Djembe along with the Moroccans, kind of giving an impromptu drum lesson. 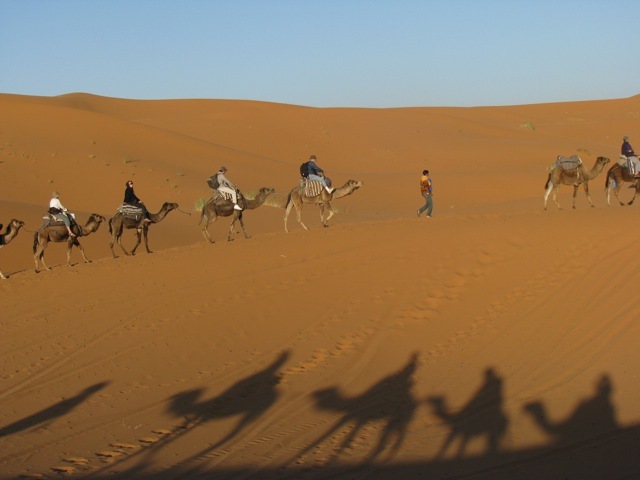 We remounted our camels, and headed out into the dunes for our caravan back to civilization. 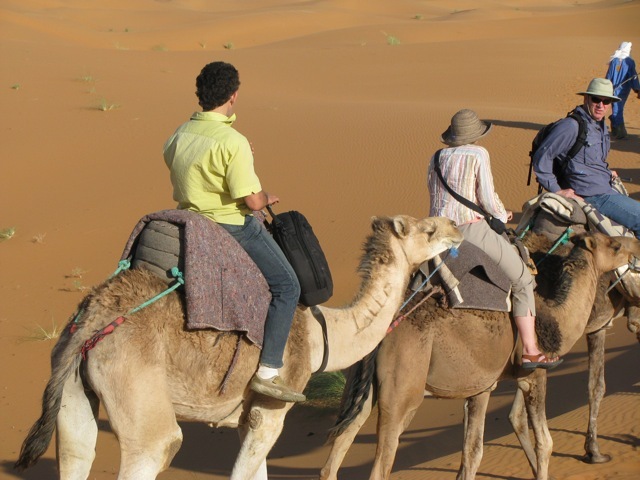 This time the camel ride was about twice as long as the night before, and when we finally arrived to our destination, I was feeling sore in the legs, and my hands were also sore from banging on the handlebar repeatedly during the ride. We entered the restaurant at the camel ride ending point (which was still about an hour from our hotel by bus), and there was a large buffet breakfast set out for our enjoyment. I had fruit, some pastry, and lots of fresh squeezed orange juice, which tasted great (though later in the evening I came down with a stomach ache, perhaps because of the breakfast, perhaps because of the dinner on the desert the night before, perhaps unrelated to either). As we waited for the bus, we were all collapsed on the pillows in the restaurant lobby, and Hamid and Yuval laid out the plans for the remainder of the day. 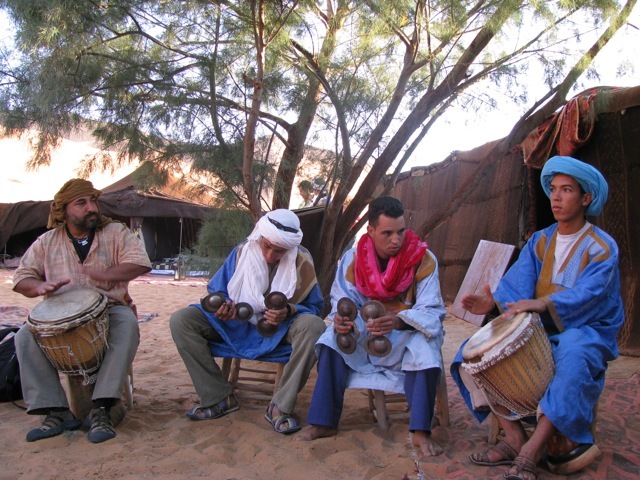 He told us about the evening plans which included a ride to a private home about an hour from the hotel, where we would see an authentic Gnawa trance music ceremony. The bus finally arrived, we boarded and eventually we ended up back at the Hotel Belere in the town of Erfound where we had departed from the night before for our Sahara desert camping trip. 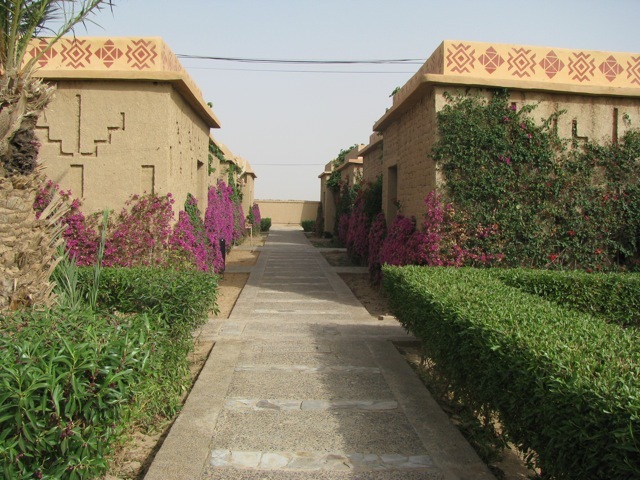 This hotel is beautiful, consisting of many bungalows covered in an exterior of clay and straw bricks. The pool area (as you can see in the pictures) looks incredibly inviting, and as soon as we got to our rooms, I unpacked my bathing suit, returned to the pool, and took a cleansing plunge into the cold, but refreshing pool. 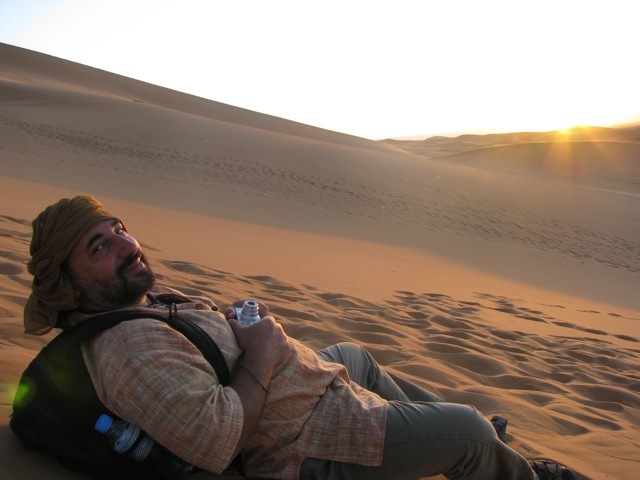 I headed back to my room, where Dror immediately went to sleep, but, finding an wi-fi connection for the first time since we arrived in Morocco, I immediately went to work uploading the first three days of details and pictures to the blog you are now reading. After completing the blogging, I returned to my room and crashed for about three hours, until about 7:30pm. As we were heading to the hotel dining hall, we found a group of musicians setup near the pool area for some evening entertainment. This ensemble consisted of oud, violin, electronic keyboard, vocals, and multiple drummers. These guys were top notch performers, and, as Hamid later told us, this was no ordinary hotel bar band, but the lead singer was one of the more respected, nationally known performers for his particular style of Moroccan music. Hamid gave a moving tribute to this singer, and we stuck around for a few more beautifully sung songs, while eating a bit from the hotel’s buffet. 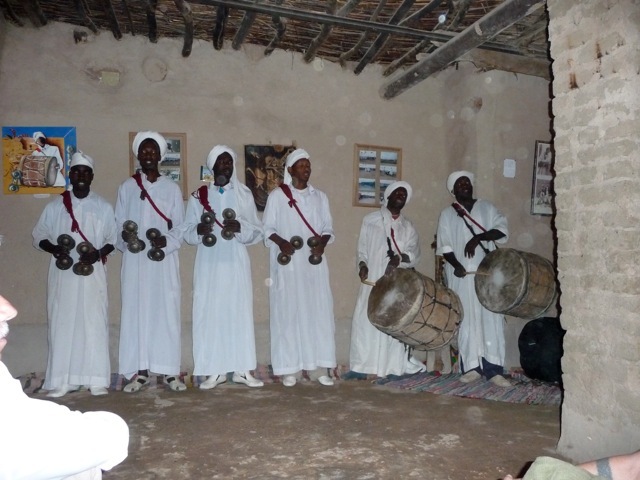 Then we were given the choice to stay and listen to the music at the hotel, or to go and see the Gnawa. 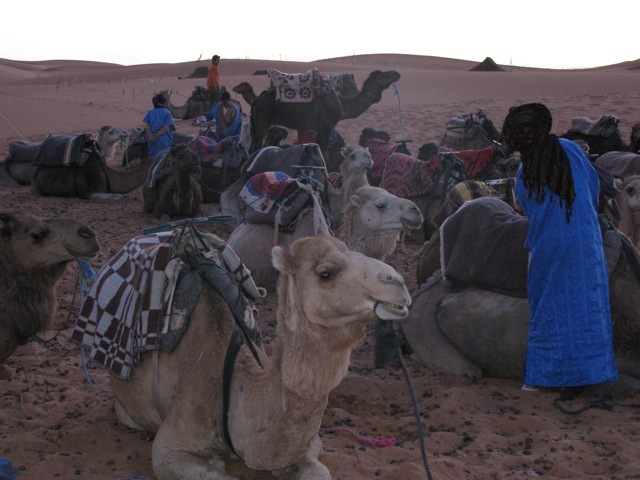 Most, including myself didn’t hesitate to board the bus once again and go to the Gnawa. 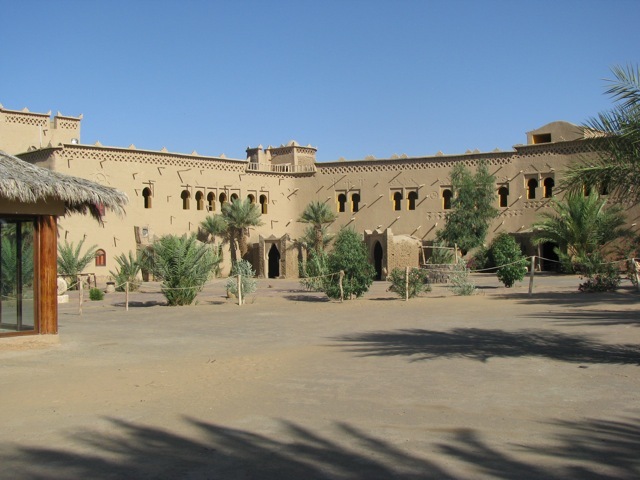 We arrived a the home of the Gnawa performers late at night, and were led into a small room where we all sat on the floor on rugs and pillows set out around the edge of the room. 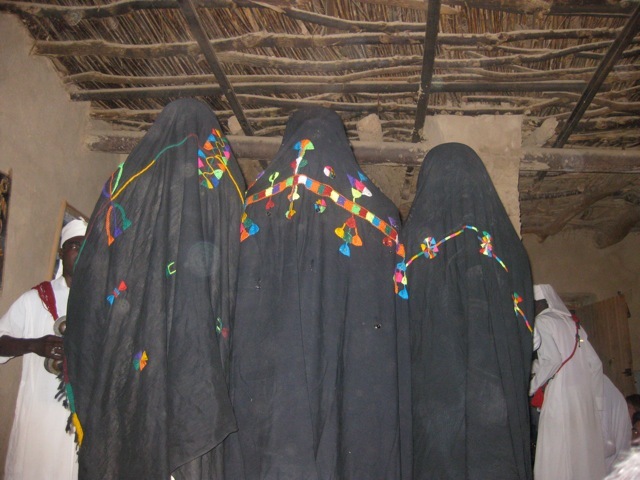 The Gnawa group consisted of a group of male performers dressed all in white, playing drums and “Karakab” clicking metal percussion instruments, and also three female trance singers dressed from head to toe in black robes and veils. There was also a bass-like instrument, with three strings, a skinned body, and a carved broom-stick like neck. which had a mellow, smooth tone to it. The music was indeed haunting and beautiful, and it was clear that these were all very talented musicians, well trained in the style of music they play. Before long, many of the tour members were up on their feet, moving to the steady beat of the music. I’ve got some amazing video of this performance as well, but you’ll have to wait for that until I get back. When the Gnawa performance was done, we re-boarded the bus, headed back to the hotel, and finally got in bed around 2am, exhausted from another long day. 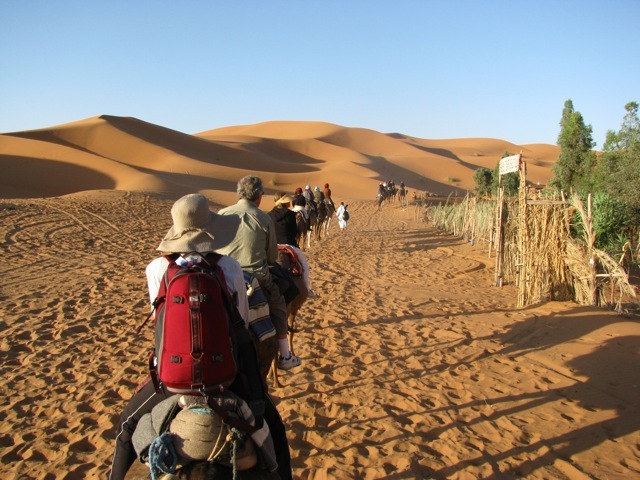 Tomorrow we go high in the Atlas mountains, and then onto Ouarzazate. This entry was posted by andy on Friday, May 29th, 2009 at 7:30 am	and is filed under Preparation. You can follow any responses to this entry through the RSS 2.0 feed. You can leave a response, or trackback from your own site.